Home > Soups > What's In a Consomme? Consommes are clear soups most often made from vegetable, meat or chicken stock, although fish can be used. Egg whites are used to ‘mop up’ any particles in the soup to leave it crystal clear. For a refreshing chilled consommé, orange and grapefruit makes an ideal summer starter, as does minted melon and cucumber. Both dishes are a useful ‘mouth freshener’ after a fish course, too. For these, though, there is no need to add egg whites. Each type of consommé has one main ingredient. For example, a beef consommé is made with brown stock and lean beef. 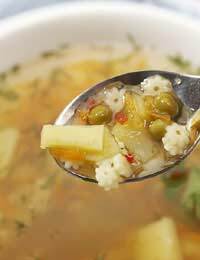 Whatever stock is used as the base for a consommé is always further emphasized by using the same chief component in the soup. Consommes are tasty, easily digested and virtually fat-free, with no hidden extras! Garnishes for consommés can be as simple or as extravagant as you wish, or use none at all. A vegetable consommé is usually garnished with match stick cut (julienne) spring vegetables which gives a clean, fresh, finishing touch to the clear soup. Strips of celery and carrot, leek and turnip should be boiled until soft then rinsed in cold water just before being added to the finished consommé. (Make sure the strips fit inside the bowl of your soup spoon or you’ll end up with carrot sticks up your nose!) Less is definitely more as the whole appearance of any consommé should be light and elegant. If you’re really going for gold, shave white truffles in front of your guests for them to add to the consommé. Strain the consommé through muslin (preferably a double layer) into a clean bowl. The foam of the egg white will be held in the muslin. Strain the consommé again through the egg foam. The end result should be perfectly clear. Reheat to serve hot or refrigerate (at least 2 hours, preferably longer) to serve chilled. Consommé: can be time-consuming and still go wrong. But, once mastered and enjoyed, its intricacies can be appreciated.